Vietnamese and Chinese New Year- With a history that dates back thousands of years, the Tet festival was originally a celebration held by Vietnamese farmers to thank the gods for the arrival of spring, sometime between late January or early February. There are also scores of regional festivals, often jointly celebrated by collections of villages. 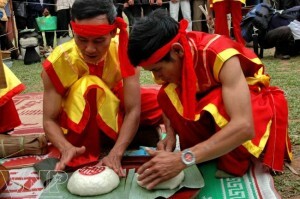 Many ethnic groups also celebrate festivals.